When Mark Taylor’s computer crashed, he suspected he had a “worm” virus in the system, but was surprised to discover the problem was caused by an actual earthworm. The discovery was made by IT repairmen who found the 5in worm lodged inside the computer. The creature had crawled into his £360 old laptop through an air vent and wrapped itself around the internal fan, leading to a total breakdown. The worm itself was burned and frazzled having been ‘cooked’ by the overheating internal workings of the Gateway laptop computer. 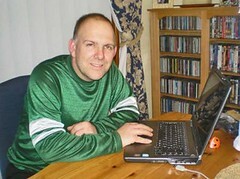 Mr Taylor, 45, wracked his brains to find out exactly how an earthworm had managed to find its way into his laptop. The culprits, he believes, were his two cats who are in the habit of pouncing on earthworms outside and bringing them into the house. Mr Taylor, from Yeovil, Somerset, said: “The worm was obviously looking for a hiding place and must have crawled in through the air vent to get away from the cats. Computer technician Sam Robinson, 28, who discovered the worm said: “The machine was displaying a message saying that the processor fan was unworkable. “I took the back off and had a look inside. Then I spotted what at first I thought was some sort of hair band or elastic band wrapped around the fan. “I soon discovered that it was a worm which had been burned to a frazzle. It had obviously wrapped around the fan when somebody had turned on the computer and caused the breakdown due to the fan jamming. “The vent in the side of the laptop was larger than normal and there was obviously enough room for the worm to get inside. This entry was posted in Computer, World and tagged bug, Cat, Computer, 當機, 筆記型電腦, 臭蟲, 除錯, 貓, 軟體, Laptop, Mark Taylor. Bookmark the permalink.